When was your most recent strategic plan developed? 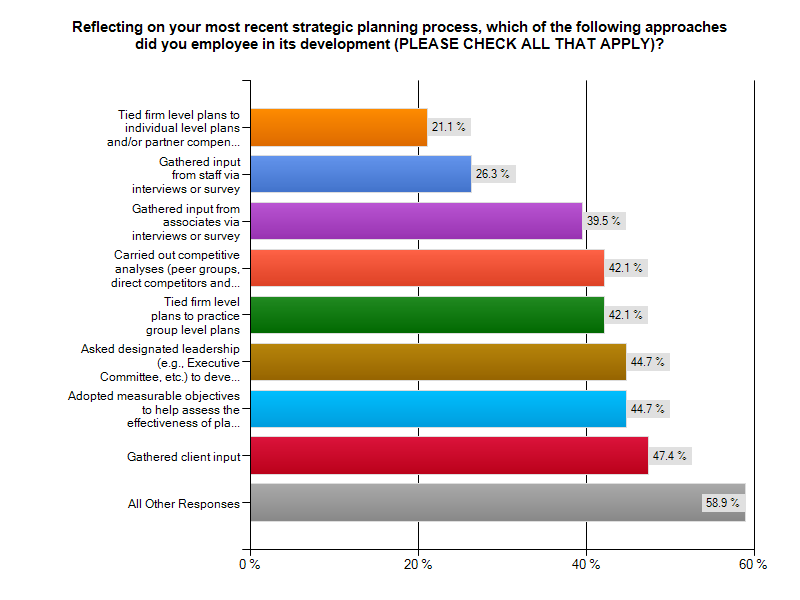 What practices did your firm adopt as it developed its strategic plan (a “check all that apply” question with 18 options)? 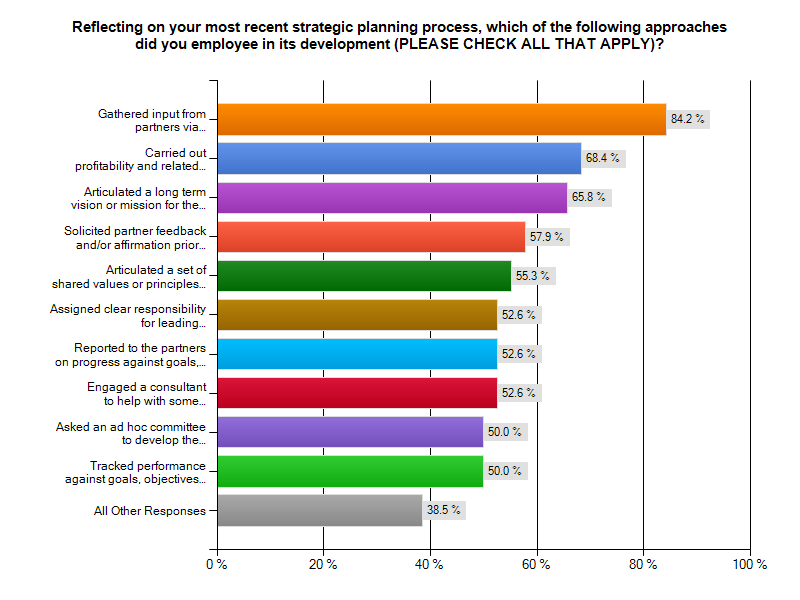 How successful has your firm’s strategic planning endeavor been (i.e., its impact on the firm’s performance)? The survey provided a helpful snapshot regarding what practices are most (and least) prevalent in the legal industry today relative to strategic planning. Those general results (the most common and least common practices) are covered in more depth below. However, what we find most interesting is the contrast between the practices employed by firms reporting the most success with strategic planning (“the plan and the process developing it have had a clear and positive impact on our law firm and its overall performance”) with those reporting disappointing results (or a “total bust”). 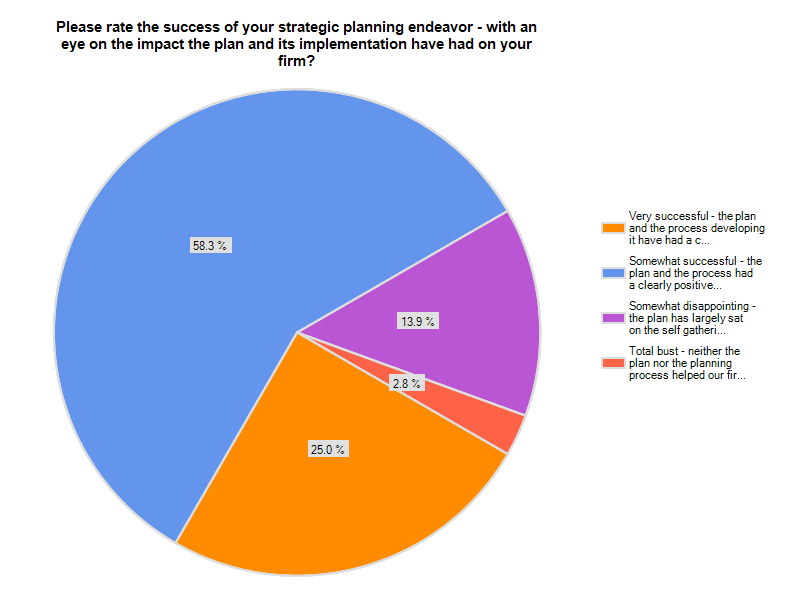 There were dramatic differences between the most and least successful strategic planning processes. Note that this mirrors in many respects the findings in our February survey on practice group management (where the most successful firms were taking a clearly different approach). The three biggest differences between the most and least successful plans relate directly to what is articulated in firms’ strategic plans. The most successful firms are much more likely to articulate shared values or principles; a long term vision or mission for the future of the firm; and measurable objectives (to help assess the effectiveness of plan implementation). Those first two points – articulating a set of shared values and a long term vision – were at the heart of Jim Collins’ and Jerry Porras’ landmark strategy book Built to Last. Yet, even with extensive research supporting the value of establishing that type of strategic direction, the highly successful firms were 72% more likely to have articulated shared values and 67% more likely to have articulated a long range vision or mission. Similarly, multiple studies have found that organizations that track performance against measurable objectives report better implementation of strategy and deliver better results. Highly successful firms were 67% more likely to track performance against measurable objectives. Reported to the partners on progress against goals, objectives or other milestones. Over the years, we have found that gathering client input in the early stages of a strategic planning process is extremely valuable. Firms that report having “very successful” planning processes were 45% more likely to have solicited client input than were firms that reported disappointing results. We have also found that implementation improves substantially when clear responsibility for leading the implementation of key initiatives is assigned to individuals and/or standing committees. Again, firms that are very successful were over 40% more likely to report having assigned clear responsibility for implementation to a champion or a standing committee. As most readers know, we have a book out on this topic through Managing Partner magazine – Strategic Planning for Law Firms: A Practical Roadmap. So, at the risk of droning on about best practices, we will stop here and report the balance of the survey findings. As always, we welcome your comments below, as well as your dialog via email (jsterling@sterlingstrat.com).